I adventured more on Naerys, taking a quest Five Against the Wold. The story was that four refugees wanted to fight back against the Easterlings, and they sought more but only I responded. This turned out to be a solo instance quest, and a warband to boot! That is, we were all mounted and would fight from our War-steeds. Starting out we were mounted on a hill, and after talking to the leader we rode off to find our enemy. The combat was fun and hectic, due to the War-steed mechanics I’m getting a little better at. I mostly charge at full speed at all times, and circle (or figure 8) the enemy, taking shots at them as I pass. I’ll work on perfecting a better War-steed battle technique, but for now this one works for me. Afterwards, I had some time leftover and I decided to look over my War-steed traits, legendary bridles, and study up a little. First, I learned that the yellow (Riddermark) traits are generally in the speed and maneuverability area, which is exactly what I want more of. The war-steed has momentum and a turning radius, and doesn’t start, stop and turn on a dime like the regular horses. That’s fine because of the mounted combat, but I want better control as I get used to it. 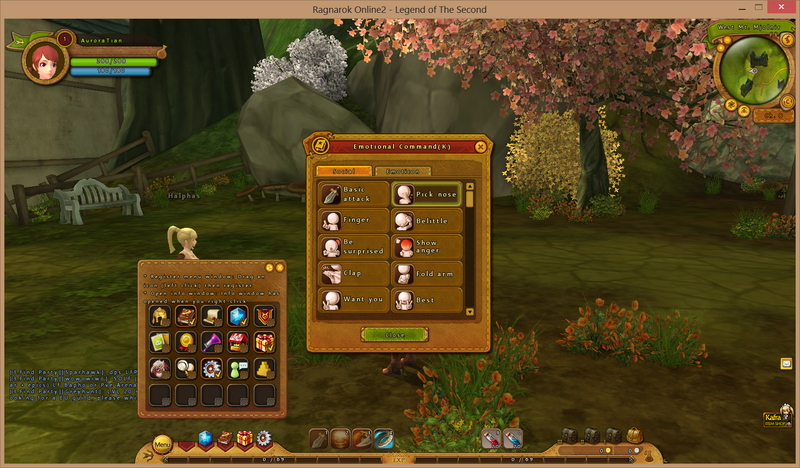 So I redid all my blue traits and spent along the yellow ones. I’ll see if that helps. Also, I looked over my bridles, as I had not yet equipped one. I know, heresy, since literally any bridle I equip would be better than not having one at all! Well I fixed that. I found one that had some armor and agility legacies, so I bumped up the Fury legacy and then armor and agility ones. And of course, equipped it. I also assigned some cosmetic enhancements. For the time being I went with a Guardian-steed theme and default colors (dyes seem to be for sale only). 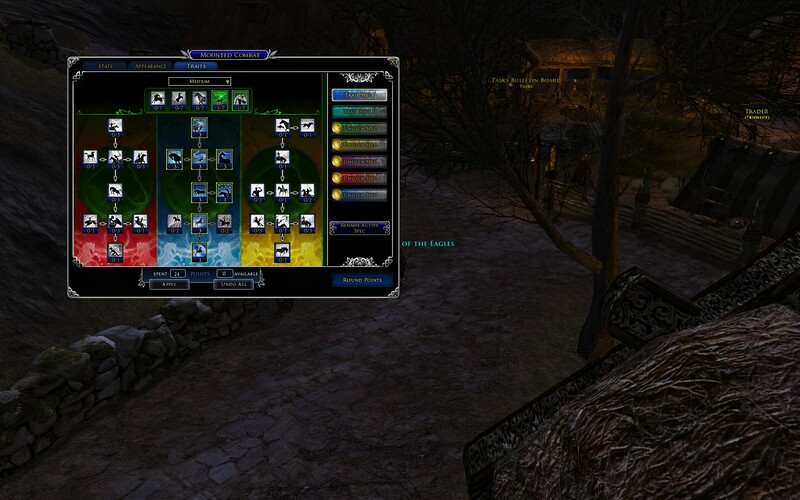 Some of you may remember I used to play LoTRO. 😉 I still do, I’ve just been off chasing the new shiny and taking a break from Middle Earth. However, over the long weekend I decided to share some quality time with my hobbit guardian. It was a bit overwhelming at first. 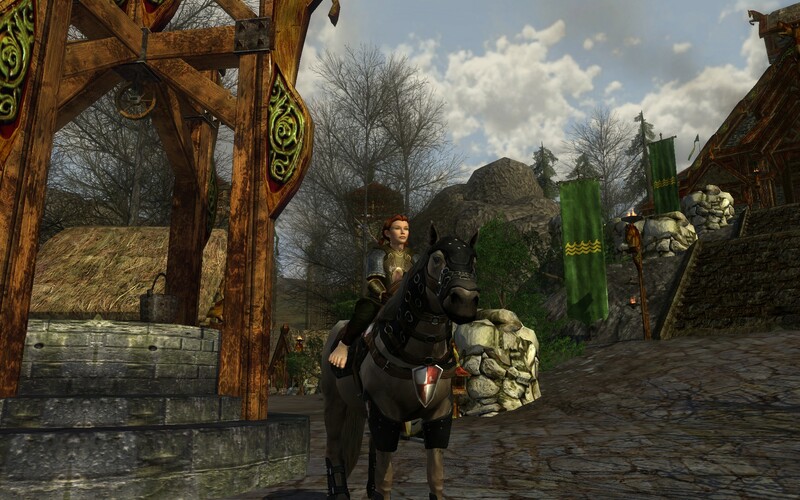 I respent points on my legendary items (club and belt), fiddled around with my War-steed (which I half remembered how to use)… but LoTRO is fairly forgiving and soon enough I was solving problems for various people in Harwick and Floodwend. It’s nice feeling like a hero! One almost un-heroic lesson I learned was this: ride your War-steed around the Wold. I do enjoy War-steed combat, but the physics of the horse take me a little getting used to. Thus for general travel, I jump on my Steed of the Guardian. Yes, I splurged in the store and bought that when it was recently up for sale. As I was crossing the landscape, I ran into a warband. It happened to be that well known miscreant, Hanrun. 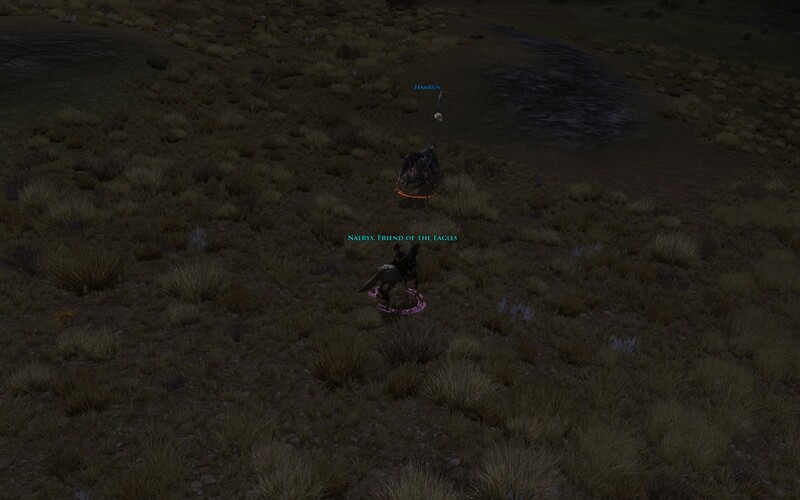 The warband quickly dismounted me from my Steed of the Guardian, but I wasn’t worried – it was just 3 of them total and guardians are fairly sturdy. 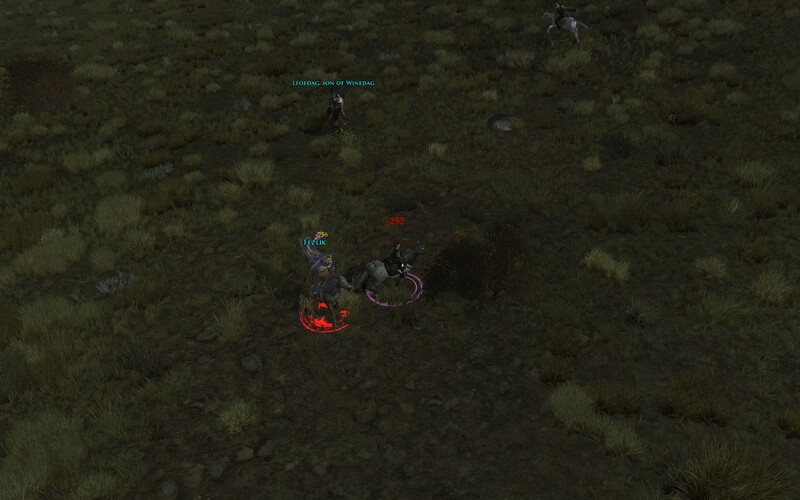 As it turns out, 3 mounted enemies pounding on me, defending from the ground, was not an even fight. I could tell it was not going well and broke off to run to nearby Floodwend, barely making it there alive. Hanrun and his allies gave chase, but eventually turned away. When I was released from combat I immediately called for my War-steed and hunted him down. If he wanted a fight I would give it to him… as long as I was on the correct mount. Eventually I found him roaming around Sarn Gabir, and engaged for another round. This fight ended differently, as I wasn’t standing on the ground fighting off mounted warriors. Later on when I had a quiet moment in Harwick, I examined my War-steed traits and spent points in the blue line, unlocking the Rohirrim capstone Survivability. I had a fun time in LoTRO, after many weeks away. Naerys hit level 80, so upgraded her armor by spending some tokens at the quartermaster in Harwick. Later I need to look over the legendary bridles I am leveling and equip one, and possibly respend my War-steed traits. There are so many new systems to become knowledgable about, I’m kind of haphazardly going about it right now. After nearly 30 hours in game, I’m finally leaving Kingsmouth for the Savage Coast. 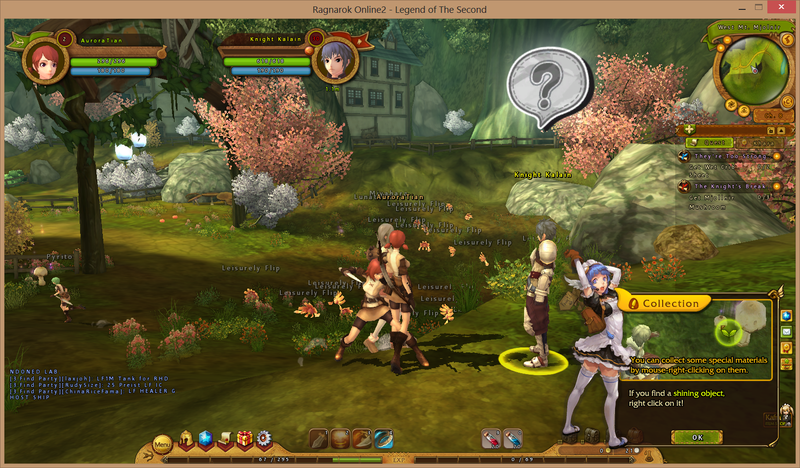 For those of you keeping score, that’s the 2nd zone in the game… I’m basically behind the entire player base. However, I am still very much enjoying myself. 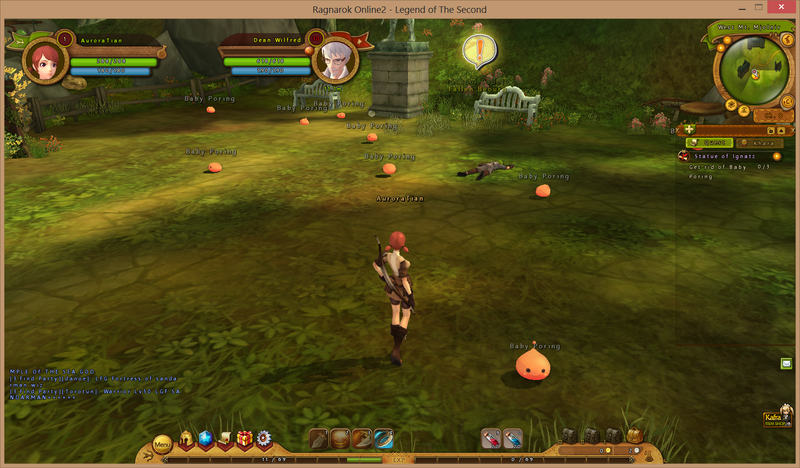 Before leaving, I went to check my quest log and lore log to see what I missed. I also checked on the wiki… I think of myself as a reasonable explorer, so imagine my shock when I found that I had missed around a dozen of the side missions in Kingsmouth! I went on a spree to hunt them down and finish them off. and eventually made it to the church and sent in my report (TSW lingo for completing the quest – many of them involve calling your faction’s HQ and reporting in). I’ve crafted my own Quality Level 3 weapons, and have a set of QL 3 talismans. In TSW, talismans take the place of armor – the talismans have various buffs and stat bonuses and can generally be categorized as tanking, healing, or DPS. Ideally players would have a set of each, allowing them to swap talismans and weapons and change group roles. I’m not that well off and kinda take what I can get. I really like the mission variety in TSW. Some missions require some stealthy action (infiltrate base, access computers while staying away from guards), some are outright puzzles (one requires solving a morse code message to get the next coords to visit), others are typical combat missions (kill X number of mobs, build up to a boss fight). My mesmer Summer hit level 35, and that meant I could get tier 1 Sylvari cultural armor. I think it looks pretty good and the only downside was the fact I blew all my money on this armor. I realized that right after purchasing 4 or 5 of the 6 pieces. Oops! That’s an issue because eventually at level 40, I’ll want to buy a Master’s Training Manual so I can put 20 points into a trait line and also open Master traits… problem is the manual costs 1 gold and I’m super poor again. I’ll cross that bridge when I get to it, but I am also willing to fix this problem the old fashioned way – spend money. 😉 As in, real world cash to the in-game shop for gems, and sell those gems for in-game gold. Yeah that’s right, if I don’t have enough gold saved up to buy the Master’s Training Manual, I’ll just “charge it”. I’m not currently playing a subscription MMO and am willing to spend $10 to $15 a month for a game I like, so I’ll just view it as my monthly MMO budget spending. After my very brief experience in RO, I’ll plunk down some moolah to support a game I enjoy playing, even if they are F2P or B2P or whatever. I’ve bought Turbine Points in LoTRO during sales and plan to keep doing so, even though I’m a VIP and accumulate them monthly. I haven’t yet spent any additional money in TSW but that game is definitely worth it to me, and I will browse the cash shop and find something I want to get. Anyway, while I’m taking Summer through the storyline (currently in the middle of joining The Order of Whispers) and exploring, I’ve decided to do the zone exploration thing on her as well. I went back to The Grove and Lion’s Arch and hit 100% completion. 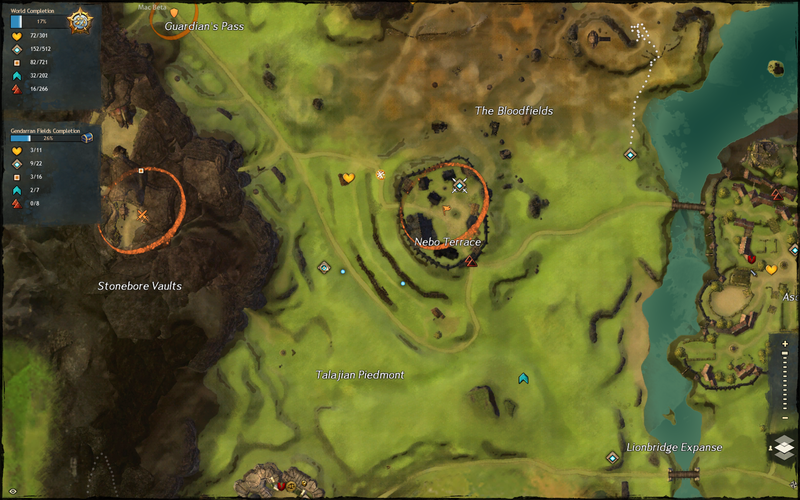 Since I was focused on opening waypoints before, this didn’t take long since I could map travel around, plus I already did this stuff on Aurora (my elementalist) so I don’t have to spend as much time figuring out how to get to vistas. I’ll do the zone completion a little differently on Summer – by backfilling a zone here and there while trying to level and keep up with the storyline. I decided to move my mesmer Summer along a bit. 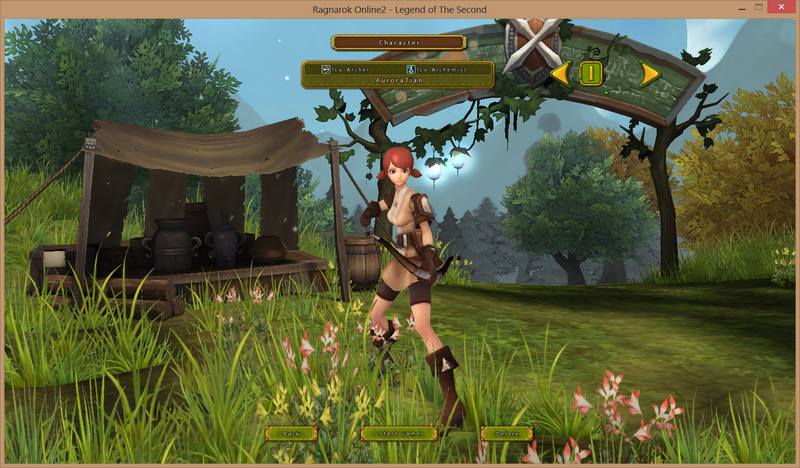 At level 27, the next storyline mission was suggested for level 28, so I finished up quests in Brisban Wildlands. Soon enough, I hit level 28 and checked the map – my destination was outside the Ascalon Settlement in the Gendarran Fields, but I hadn’t explored that map much. In fact, I only had the Stoneguard Gate Waypoint in the northwest, from the previous step in my storyline. I mapped in and started running overland, approaching Nebo Terrace. I detoured to grab the waypoint, and found a dynamic event going on, with several players participating. 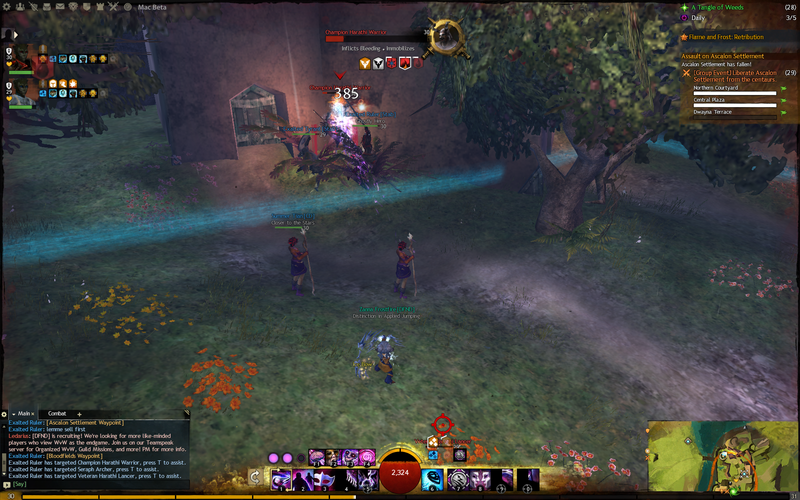 So I joined in… and was invited to group with 2 other players. I figured what the heck, and accepted the group request. After the event finished, the leader just put a waypoint in chat. I checked the map and saw they had already map traveled away and were running towards another orange circle – how a dynamic event shows up on the map. I joined them and as soon we’d finish one, they were off to another. I followed as best I could – I had to take the long route sometimes because I lacked waypoints, but I ran by to collect the ones I didn’t have, and eventually I was able to map travel with them. We continued like this, racking up experience points like crazy. We hit a cycle of four dynamic events that seemed to be available fairly often: defend Nebo Terrace, kill Veteran and Champion centaurs in a cave, kill Rock Dogs, and defend Ascalon Settlement. Sometimes there were 2 Veteran centaurs in a warcamp we detoured to defeat, detouring from running to another event. It was pretty fun and I think I participated in more Veteran and Champion kills during this time than the whole of my “main” char Aurora (who is level 80). Summer went from level 28 to 31 (halfway to 32) in one evening! I hope to group with those two again, but if they keep cranking away like tonight, they’ll be 5-8 levels higher before the next time I’m on. 😉 In that case I’m good with doing the storyline questing along. But I’ll definitely look to join up with other players doing events, it was fun and very efficient. I’ve spent my last few play sessions attempting to wrap up Kingsmouth quests. I thought I was almost done, yet by visiting each of the various quest givers, I’ve found most still have a quest (or two) for me to do! I’ve been experimenting with decks, and have spent my ability points buying skills so I’ve now unlocked 3 starter decks: Trickster, Cagemaster, and Champion, and as a by-product have also unlocked more clothing options (the uniforms associated with each of those starter decks). I like the look of the Trickster the most so I end up wearing that the majority of the time. Next up will be unlocking the Maverick deck, and then I’ll just accumulate ability points for purchasing “inner circle” abilities. For one, getting decent weapons to cover all these decks take resources, and two, spreading my ability points all over probably isn’t too wise. However, I do like build variety so have 4 starter ones to choose from and switch between is worth it to me. Quest wise, I’m finding them still fun and the puzzles challenging and mostly fair. OK, I cheat a little by reading along if I’m stuck, but a lot of guides will avoid direct spoilers and give a hint – for example there was a quest the involved a password to log onto a computer. The hint in-game was “my wife’s name” and the hint on the wiki said “check the bodies on the beach”. Sure enough, I found an id card and then, in a leap that doesn’t exist in many other games, I opened a webpage for the fictional corporation (the Orochi Group) and searched around and found the scientist’s wife’s name. Thumbs up! I was able to defeat this monster and wrap up a quest before zipping off to New York to continue my storyline.